F-35C Lightning II aircraft from Strike Fighter Squadron (VFA) 125 are conducting their Operational Test-1 (OT-1) with Carrier Air Wing (CVW) 7 and Carrier Strike Group 12 aboard the Nimitz-class aircraft carrier USS Abraham Lincoln (CVN-72). OT-1 evaluates the full spectrum of the F-35C’s suitability for operation within a carrier air wing and mission effectiveness to the maximum extent possible. «The F-35C Lightning II brings stealth, enhanced electronic capabilities and a different sustainment model», said Rear Admiral Dale Horan, director, Joint Strike Fighter Fleet Integration Office. «Operating this new generation of aircraft out on the aircraft carrier brings a different set of tools, techniques and procedures, and we’re learning how to integrate them into the battle group». The F-35C Lightning II has the ability to pass on the information it collects not only to other F-35s in the air, but to legacy aircraft, carrier air wings, strike groups and troops on ground, enhancing the warfighting potential of the fleet. Evaluators have been assessing the suitability of the F-35C Lightning II aboard carriers by defining how well it performs with other aircraft and incorporates into an air plan, monitoring maintenance and identifying its logistics footprint. «We hope to see how it integrates onboard the ship», said Horan. «Can we maintain it? Can we get the parts? Can we get it airborne? Can we repair it if it has a problem? Those are the kinds of things we are looking for». 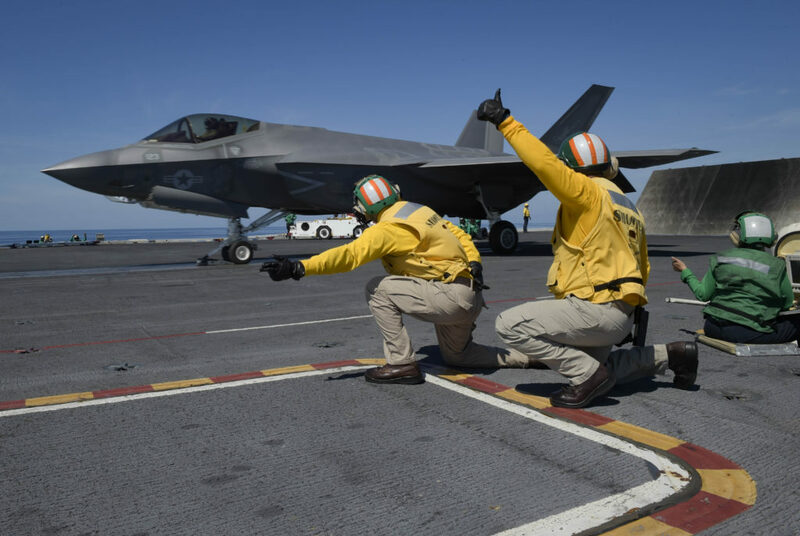 In addition to assessing the suitability of the F-35C Lightning II on a Nimitz-class class aircraft carrier, OT-1 evaluators observed the effectiveness of the F-35C Lightning II in real-world scenarios. «The effectiveness piece is what we’re doing when we’re airborne and executing missions», said Captain Matt Norris, from the Joint Strike Fighter Operational Test Team. «We’ve been integrating with the strike group and accomplishing many missions like defensive counter air and anti-submarine warfare, for instance». Previously, F-35C Lightning II and F/A-18 Super Hornet pilots have only conducted carrier qualifications together, so OT-1 marks the first time the F-35Cs have joined a carrier air wing to perform in a cyclic operations environment. During cyclic operations, aircraft simulate missions, practice aerial maneuvers and take off and land continuously with brief pauses to allow for maintenance, fuel and ordnance changes. Aboard Abraham Lincoln, the F-35C Lightning II has been flying cyclic operations with F/A-18 Super Hornets, E-2D Hawkeyes and EA-18G Growlers, conducting missions it would execute in combat if required. The addition of the F-35C Lightning II brings advanced capabilities that transform the way an air wing conducts operations. Operational Test-1 helps give the U.S. Navy an assessment of how the aircraft would perform on deployment. As adversaries advance and legacy aircraft age, the F-35C Lightning II is critical to maintaining air dominance. «This is the first time we really see how the aircraft works on the aircraft carrier; how we do maintenance and sustain it while we’re at sea; how it integrates with the ship; how it interoperates with communications, datalinks, the other aircraft; and how we conduct missions and tie in to other aircraft when we conduct missions», said Horan. And while pilots adapted to the new aircraft, the crew of Abraham Lincoln also adjusted to the F-35s. From Aviation Boatswain’s Mates to Air-traffic Controllers, each Sailor learned to manage the aircraft with its unique attributes and capabilities. «The level of planning that is required to execute an evolution like we did for OT-1 is huge, so everyone aboard Abraham Lincoln should be proud of the level of effort that they put in and how well they executed», said Norris. «We can’t fly this aircraft without everything the ship does for us, and the Lincoln has been an impressive ship». With the successful completion of OT-1, the fifth-generation aircraft is one step closer to becoming deployable in the U.S. Navy fleet. «The aircraft looks like a naval aircraft on the flight deck. From that perspective, the big picture looks pretty good», said Horan. Data and lessons learned during OT-1 will lay the groundwork for future F-35C Lightning II deployments aboard U.S. Navy aircraft carriers following the Navy’s F-35C Lightning II Initial Operating Capability (IOC) declaration.